Days before the U.S. military commitment in Iraq ends, President Barack Obama has thanked American forces who served in the nearly nine-year-long conflict. 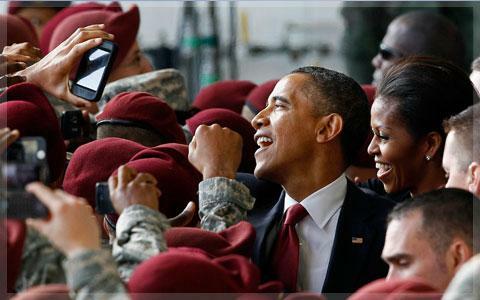 The president visited Fort Bragg, North Carolina to welcome returning troops and express the country’s gratitude. “So as your Commander In Chief, and on behalf of a grateful nation, I am proud to finally say these two words, and I know your families agree: Welcome home," said Obama. "Welcome home. Welcome home." Special Forces soldiers from Fort Bragg were among the first to enter Iraq in the 2003 invasion. The base is also home to several units of paratroopers who helped lead the troop increase in Iraq in 2007. Mr. Obama recognized the sacrifices made by U.S. service members in Iraq. The last U.S. troops are to leave Iraq by December 31, although Mr. Obama has pledged to support Iraq as it works to establish a democratic government in a dangerous region. The president called the results of the war an extraordinary achievement. The president told the troops that he could not be prouder of them, and that the nation could not be prouder of them. “The war in Iraq will soon belong to history. Your service belongs to the ages," said Obama. Mr. Obama has made numerous visits to North Carolina, which is seen as an important state in his 2012 re-election campaign. The state’s largest city, Charlotte, will host the Democratic National Convention in September. One of the leading Republican presidential contenders, former Massachusetts governor Mitt Romney, sent a letter to a newspaper based near Fort Bragg, criticizing the high unemployment rate among veterans. Mr. Obama and his wife Michelle told the soldiers at Fort Bragg they are working to ensure that returning veterans will receive jobs and needed medical care.